Linda Castillo (website) is an American author best known for her popular Kate Burkholder crime thriller series, set in Amish county. Reading the author’s books in order means picking up the series, which currently includes nine books and two short novellas. The latest book in the Kate Burkholder series, book #10, is published in 2018 with the name A Gathering of Secrets. Of course, then you also have the author’s second set, Operation: Midnight, a series which is also worth reading in order. Kate Burkholder grew up in an Amish community, and she left soon after she was sexually assaulted by a local member of the church. She did stay another four years before leaving, while constantly growing more and more doubtful by the way of life she was involved in. She finally left the community at the age of 18. In the meantime, she became a successful and highly respected police officer. She is now 30+ and she finally decided to return to her home roots to Painter’s Mill in Ohio. As she grew up in the area and had an Amish background, she was soon made the town’s Chief of police. Kate is a very human character. She has her flaws, but she is a good person who wants to do good in her town. She is not very outgoing, she is more of a reserved person, and she no longer feels she belongs to the Amish. Throughout the Kate Burkholder novels, the Amish keep recurring due to various crimes committed that involves the community as well. Every now and then, she is confronted with her past, and she is constantly reminded of her roots. If there is one mystery series that sheds some light onto the Amish community, this is it. Here are the Linda Castillo books in order for her series and standalone novels. 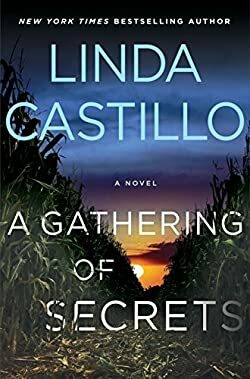 Born in 1960 in a small farming community in Western Ohio (which is also the setting for her Kate Burkholder series), Linda Castillo knew from an early age that she was meant to write novels. She wrote her first story at the age of 13. She met her husband in 1985. She currently lives in the Texas Panhandle on a small ranch with her husband, where she works on her next novels. In her spare time, she loves riding horses on her property. Sworn to Silence, her debut thriller, is also the first in her popular Kate Burkholder series, which was well received by readers and critics alike. The author’s insights into the Amish community is higly regarded, and her books give an interesting glimpse into the people’s lives, particularly that the Amish are rather closed to the outsides and often their lives are a mystery. Linda Castillo did extensive research, read a few scholar books on the topic, and also lived for a while with several Amish families during her trips to Ohio for reserach. Her books won so far several nominations and industry awards. I have read several novels from the Linda Castillo book list, including some of her romantic suspense stories, and if I have to choose, I’d definitely go with her Kate Burkholder series. I love that series. Kate is a young Amish girl living in a quiet and peaceful rural town called Painters Mill in Ohio. After a series of tragic events which left Kate scarred emotionally and psychologically, she left the place, seemingly for good. Years after, she is asked to come back to the town as its chief of police. In each of the books, Kate is called to solve various crimes of murder and bring the killers to justice. As I mentioned above, the books should be read in the proper chronological and publication order, since each novel builds up (in terms of character progression) from the previous one to the next one. Apart from her popular series featuring Kate Burkholder, the author has also written a romantic suspense series called Operation: Midnight (Harlequin), including 5 novels, and a romance series called High County series (Silhouette Intimate Moments), which includes 3 novels. I have read every one of Linda’s Kate series. I need to read one more, which is only ebook. I look forward to her next Kate series. I just can’t put the book down once I start reading. Excellent. She is the best author ever. I have read many books in my life but nobody as great as Linda Castillo. So far I have read 6 of the Kate Burkholder series. Love them all! Please write more of them. I am running out. Can I get A Hidden Secret in book form? I do not own a kindle. Unfortunately no, because it is a short eBook, not a full novel. These short stories are always only published in eBook format, unless the author decides to bundle one together with the next book as part of a bonus. would like to see more of the Amish series with Kate Burkholder. One of my favorite! Would like to see more of the Kate Burkholter series. One of my favorite!